This little girl stole our hearts over 6 years ago. From the moment I was pregnant, we began praying for our precious peanut. Ultrasound glamor shots, little kicks and prenatal hiccups quickly began a beautiful relationship between our little family of soon-to-be-three! She’s always loved music. From a little princess still in training and nestled in her carrier, she would raise her hands during praise and worship in church. Smiling. While sleeping. Cutest thing ever! She has started writing “Jesus songs” and says one day she wants to be a Jesus song writer. In addition to an army girl, nurse like daddy, Chick-fil-A worker like mommy, cowgirl, and person who helps people. We’ve laughed, we’ve cried, and we’ve experienced so much joy with this sweet little girl. She loves Jesus so much and wants others to know her darling Savior. She always asks questions about the bible and often cries precious crocodile tears begging to go meet Jesus. Begging. She wants to pray for people she sees hurting when we’re out running errands. This girl is so observant. She noticed a man on day in a wheelchair and immediately whispered to me, “Mom, let’s pray for him.” Nothing slips past her and she is sincerely compassionate. I’m not saying we walk on water. We have our off days. And weeks. But God definitely has blessed us with a very special little girl. She is a perfect mix of my husband Gary and I. And today was a very special day for our family. My husband is an ordained minister in the church of God, and he was given the privilege of baptizing several teens and children today. One of those children – Kendyl. Our baby girl. Two years ago she came running in the living room and told me she asked Jesus to come live in her heart and told Him how much she loves Him! You see, we make it so complicated. 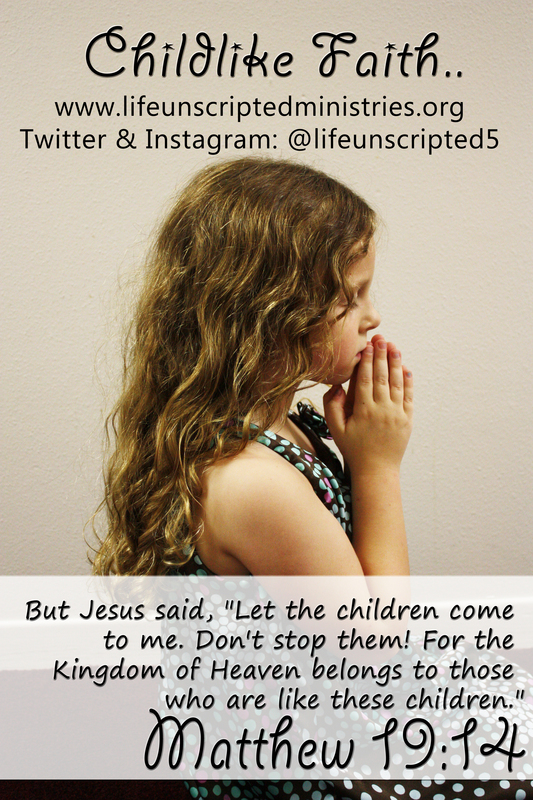 Jesus made it simple enough that a child could understand. We tell our children about a big guy in a bright red suit who watches them while they sleep and the bunny that brings them candy that will rot their teeth out. And..they..believe. There is hope for the hopeless, strength for the weak, healing for the hurting, love for the unlovable, and salvation for the lost. We are all so desperate for a Savior, yet the world we live in constantly rejects Him. Don’t try to analyze God’s love for you. I’ll admit, it simply doesn’t make sense why a perfect and holy God would want to have anything to do with a mess like us. But He does. And He loves us with such a deep, unconditional love that blows my mind. Do you remember that life changing moment in your life when you surrendered your heart to Jesus Christ? I remember being 5-years-old, getting the cordless house phone and crawling underneath my bed. My Papa’s phone rang and on the other end was a curly-headed little girl wanting to ask Jesus to come live in her heart. Life hasn’t always been easy, that’s for sure. But God has walked with me, even through my biggest messes. I’m so thankful He loves us where we are but refuses to allow us to wallow in the sewage and settle for less than the best that He has for us. As adults, we like to dip our toes in the water before stepping into the pool. Kids on the other hand? No way. They take the towel off their shoulders and kick off those flip flops in 2 seconds flat. Before we can set the pool bag down, they take off running to do a giant cannonball into the cool, refreshing water. If life has you in the fetal position or feeling washed up with nothing left to give, I want to encourage you tonight. Stop testing the water. It’s time to walk to the edge of the pool and jump in. All of Heaven is waiting for you. If you know something is stirring in your heart but you’re not sure what the next steps are, please comment below or message me. I’d love to talk with you more! Not only is this a special story, It is a really good reminder as an adult to aspire to a more simple and yet deeper faith. Thanks!